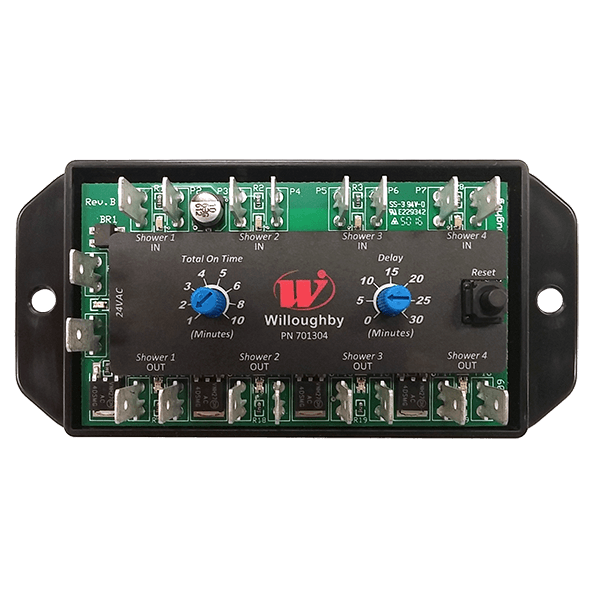 The Willoughby WUSC-2400 Electronic Water Usage 4-Shower Controller is a stand-alone electronic module designed to control the operation of up to 4 electronic shower valves, either from inside a shower fixture or from the mechanical chase. The WUSC-2400 controller is capable of controlling a total of 4 low-voltage solenoid flush valves. All input, output, and power functions of the controller have corresponding LED diagnostic indicators for testing and monitoring, as well as a reset push button to restore controller functionality. The WUSC-2400 controller will come with a TF24H hard-wired 110VAC to 24VAC transformer and appropriate WUSC-KIT controller wiring kit. The WUSC-2400 4-Shower Controller is recommended for correctional facilities and other applications that would benefit from water conservation, usage control, and the abatement of potential vandalism, and is compatible with nearly all Willoughby shower fixtures equipped with electronic valves. The Willoughby WUSC-2200 Electronic Water Usage 2-Shower Controller is a stand-alone electronic module designed to control the operation of up to 2 electronic shower valves, either from inside a shower fixture or from the mechanical chase. The WUSC-2200 controller is capable of controlling a total of 2 low-voltage solenoid flush valves. All input, output, and power functions of the controller have corresponding LED diagnostic indicators for testing and monitoring, as well as a reset push button to restore controller functionality. The WUSC-2200 controller will come with a TF24H hard-wired 110VAC to 24VAC transformer and appropriate WUSC-KIT controller wiring kit. The WUSC-2200 2-Shower Controller is recommended for correctional facilities and other applications that would benefit from water conservation, usage control, and the abatement of potential vandalism, and is compatible with nearly all Willoughby shower fixtures equipped with electronic valves. 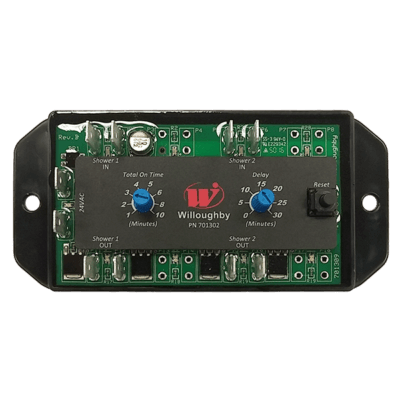 The Willoughby WUCC-3010 Electronic Water Usage Combi Controller is a stand-alone electronic module designed to control the operation of electronic valves on a single lavatory/toilet combination fixture (Combi), either from inside an individual toilet fixture or from the mechanical chase. The WUCC-3010 controller is capable of controlling a total of 3 low-voltage solenoid valves: 2 lavatory valves (1 hot valve and 1 cold valve), 1 electronic flush valve. An electronic toilet overflow sensor is integrated into the WUCC-3010 for use with fixtures manufactured with overflow sensor capabilities. All input, output, and power functions of the controller have corresponding LED diagnostic indicators for testing and monitoring, as well as a reset push button to restore controller functionality. The WUCC-3010 controller will come with a TF24H hard-wired 110VAC to 24VAC transformer and appropriate WUCC-KIT controller wiring kit. The WUCC-3010 Combi Controller is recommended for correctional facilities and other applications that would benefit from water conservation, usage control, and the abatement of potential vandalism, and is compatible with nearly all Willoughby combination fixtures equipped with electronic valves. The Willoughby WUFC-4000 Electronic Water Usage Flush Controller is a stand-alone electronic module designed to control the operation of electronic flush valves on up to 4 toilet fixtures, either from inside an individual toilet fixture or from the mechanical chase. 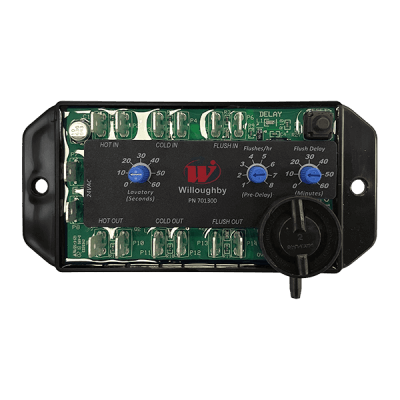 The WUFC-4000 controller is capable of controlling a total of 4 low-voltage solenoid flush valves. All input, output, and power functions of the controller have corresponding LED diagnostic indicators for testing and monitoring, as well as a reset push button to restore controller functionality. The WUFC-4000 controller will come with a TF24H hard-wired 110VAC to 24VAC transformer and appropriate WUFC-KIT controller wiring kit. The WUFC-4000 Flush Controller is recommended for correctional facilities and other applications that would benefit from water conservation, usage control, and the abatement of potential vandalism, and is compatible with nearly all Willoughby toilet fixtures equipped with electronic valves. 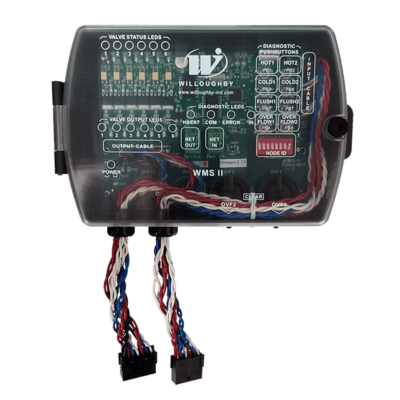 The Willoughby WMSII Water Management System is a PC-based water control system for use with Willoughby Cell Valve Controller-equipped plumbing fixtures. By serving as the operator interface for multiple individual trunks of networked Cell Valve Controllers (CVC2), the WMSII system allows full water usage control of up to 4 networks, each with a maximum of 127 nodes connected by up to 4,000 ft. of CAT 3 network wiring, through a centrally-located PC workstation. The typical WMSII system will consist of a user-selected PC workstation, pre-programmed with a facility-specific WMSII control system; chase-mounted CVC2s, in networked or stand-alone configurations as specified; 8 ft. of CVC2-to- valve/switch wiring; and any additional support or equipment as specified. Using a WMSII system control workstation, an operator can remotely view and control any function of any networked plumbing fixture. Each CVC2 is capable of controlling a total of 6 low-voltage solenoid valves: up to 2 lavatory/toilet combination units (1 hot valve, 1 cold valve, and 1 flush valve for each unit), 3 individual lavatories (1 hot valve and 1 cold valve each), 4 toilets with overflow sensors, 6 toilets without overflow sensors, or any other combination of 6 valves. The Willoughby WMSII system is recommended for correctional facilities and other applications that would benefit from water conservation, usage control, and the abatement of potential vandalism. 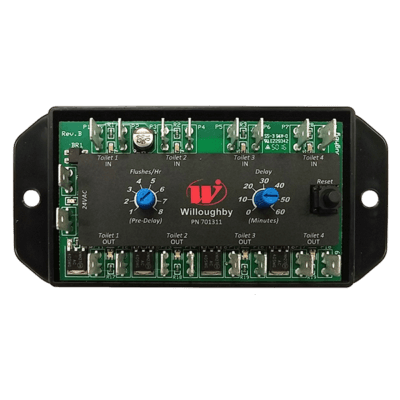 Nearly all Willoughby back-supply fixtures with an accessible mechanical chase can be networked to a WMSII system.